A beautiful, invisible, fully reversible seam for the incredibly elastic crochet slip stitch "ribbing" that looks like knitting! Here I have made a basic tube from the crocheted ribbing, where I show it swallowing a cricket ball. The tube is fully relaxed at the top. One tail is from where I did my starting chain, the other is the tail from where I finished the seam, which runs right down the middle between them. When I made the Soccasins pattern I used a slip-stitch crocheted ribbing for the sock legs because it looks like knitting and is incredibly elastic - much more elastic than any knitted ribbing I've ever found. Click the in the window below and with a little luck you'll see a video showing just how springy it is. 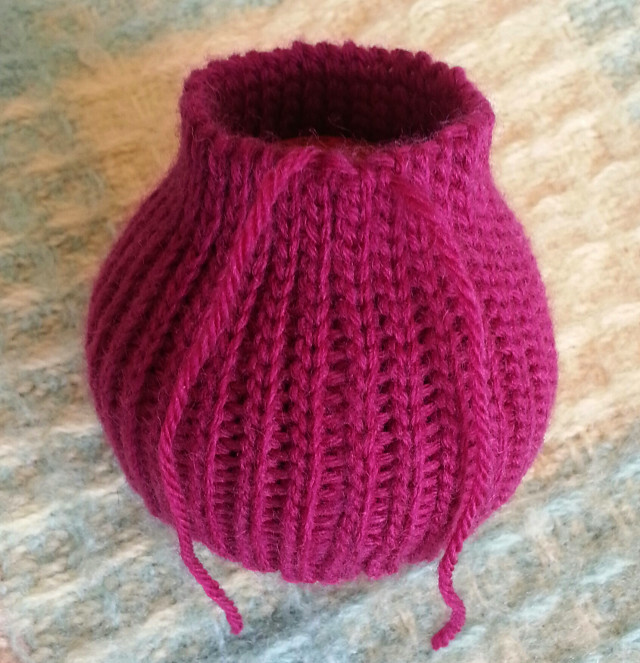 Later I used the same kind of ribbing for the bottom of my Puffy Rib tea cosy - again because it is so elastic. In the past I've always used a crochet slip-stitch to do the seam and while it was passable I wasn't fully satisfied because it didn't mimic the ribbing itself very well. On a short piece my eye isn't drawn to it very much, but on a long piece it really bothers me. 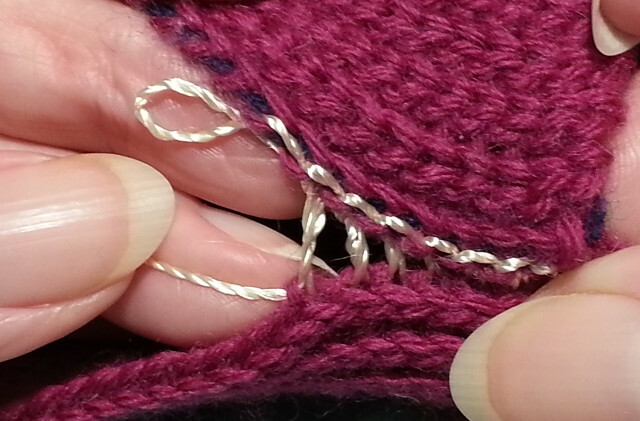 Now I've worked out how to do that seam based on the same principles as grafting (Kitchener-stitching) in knitting. 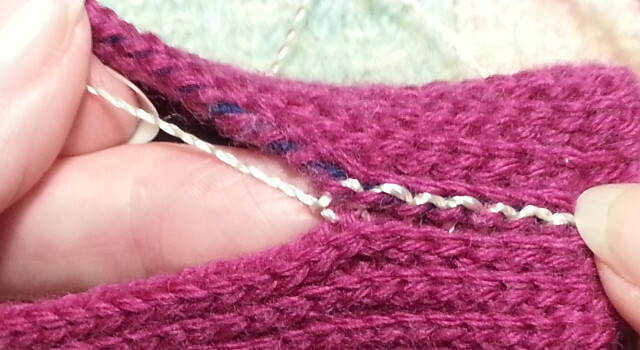 In this case I've used it to duplicate a slip stitch done through the back loop. 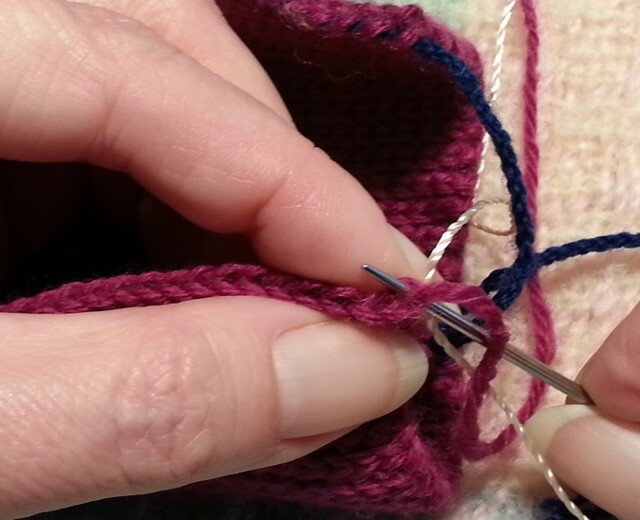 The same principle can be used to duplicate other stitches if you are very careful to study the path of the yarn through the stitches and how they connect to the rows above and below them. To work that out I recommend working a few rows of your stitch pattern in one colour, then changing to another colour to work another row (in the direction your "graft" row will be) and then continuing with your pattern in another colour. The colour changes will let you see exactly how the working thread in your grafted row is connected to its neighbouring rows above and below. In the following sequence of pictures I have used a contrast, slippery yarn so that you can clearly see where the working thread is going. The first few pictures show you how to start. 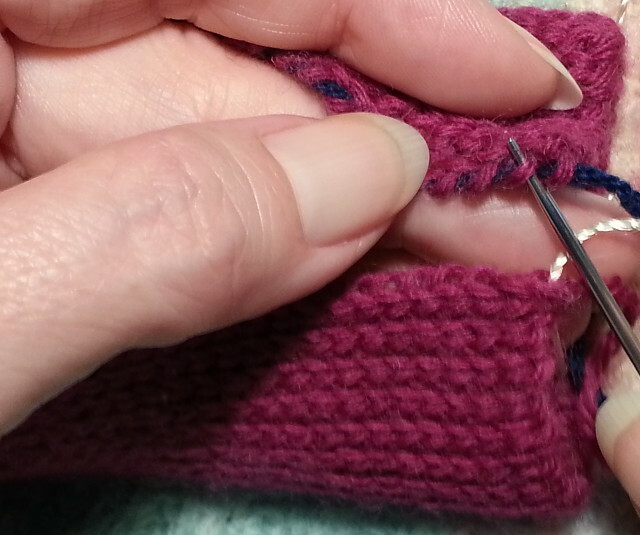 When you do this for your real seam you would use the tail that you see coming out of the last stitch on the bottom. For these pictures I have put it aside and used a contrast thread exactly as if it was the true tail. Tip: To work out how long you need your tail to be then, before you cut your thread and pull the tail through, work as many chain as you have slip stitches in your ribbing and add 15cm or so. Then cut your tail, undo these extra chain and pull the tail through. 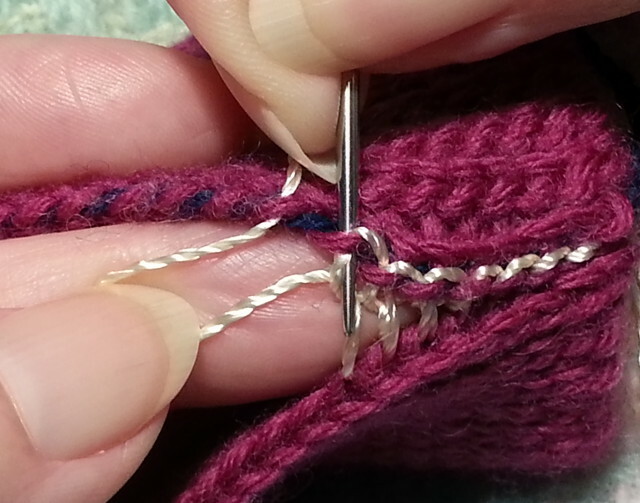 Please go through the whole stitch sequence below before you try it and pay particular attention to where the needle enters and exits stitches, the orientation of the loop being held by the left thumb, and how the working thread is put through the loops that have been created with the working thread. It will take a little practice to perfect your tension and, as with most things, the more you practice the better you get. To work a small sample of the crochet ribbing chain 25. 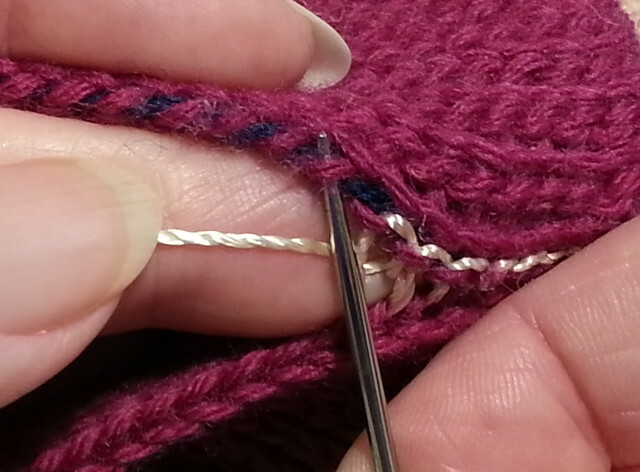 Run a guide thread through the back ridge loops of every stitch (see the tutorial below). Next row: Slip stitch into the back loop (not the back ridge) of the 2nd chain from the hook and every chain to the end, chain 1, turn. 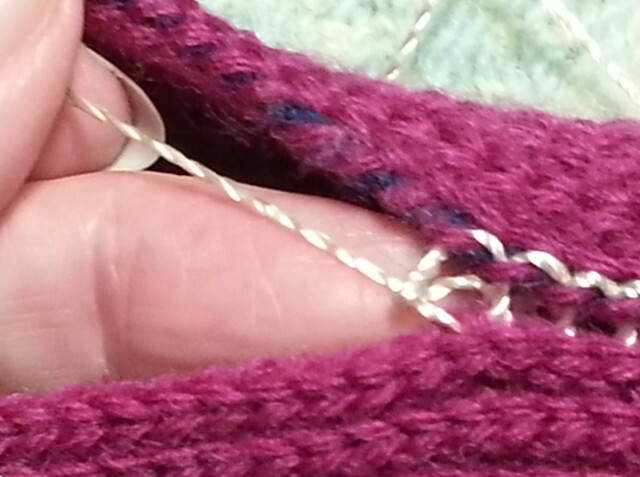 All other rows: Slip stitch into the back loop of every stitch (excluding the turning chain), chain 1, turn. Be careful that you get the very last stitch on each row, it likes to hide. 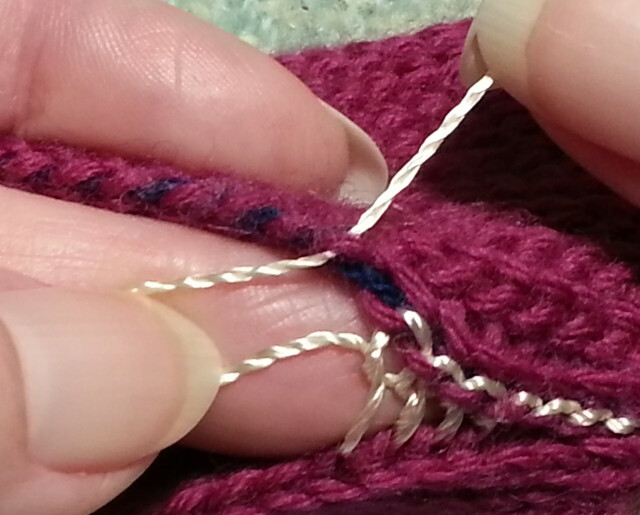 Check your stitch count periodically and don't let your slip stitches get successively tighter and tighter. 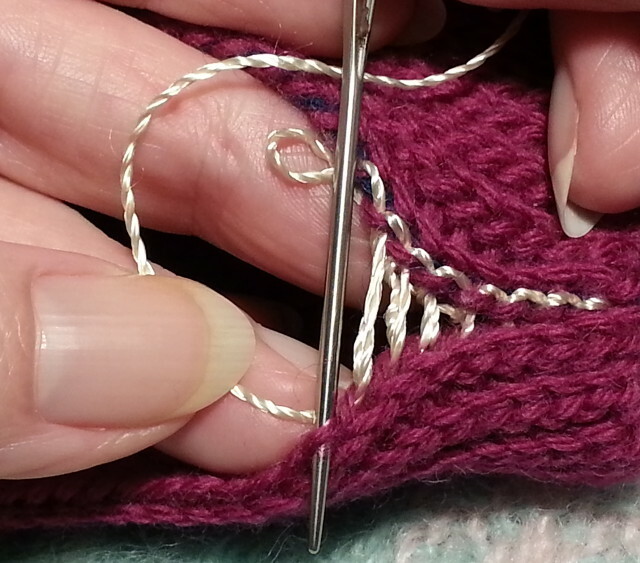 Stop when you have a a 15 cm length of ribbing and before you do the chain. Your last row should finish at the opposite end to the starting tail. Leave a tail (the tutorial explains how much to leave) and pull it through, ready to do the seam according to the tutorial. When you have finished the seam your starting and finishing tails will be at the same edge. Step 1: The dark blue thread was run through the back ridge loops of the starting chain straight after the starting chain were made and before I continued with any slip-stitch ribbing. 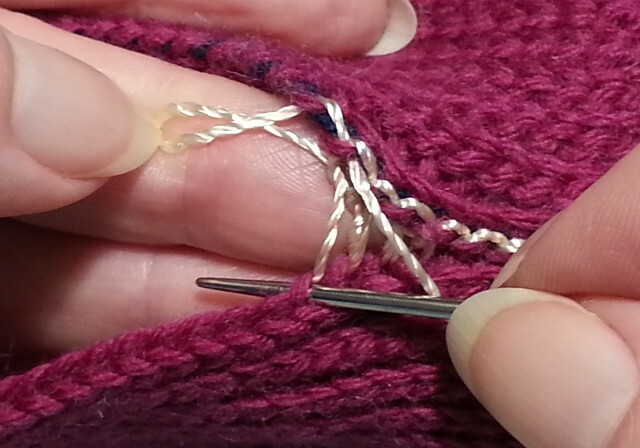 Do this so that when it is time to graft it will be easy to find these back ridge loops again. After you have finished the graft you will pull out this blue thread. 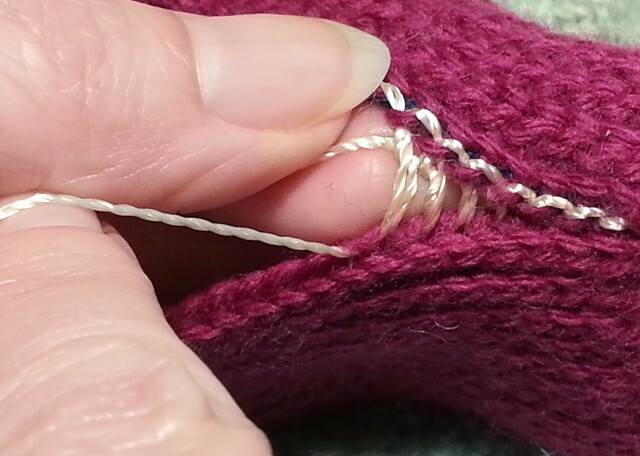 Step 2: First bring your tail up through the last stitch you made and pull the thread through. We'll call this the bottom side of the seam. Step 3: Now swap to the other side (which we'll call the top side of the seam) and go up through the second back ridge loop from your starting chain (marked for you by the blue thread) and pull the thread through. Step 4: Now come down through the first back ridge loop on the same side. Pull the thread through but note where I am holding the thread with my left hand to make a loop. Step 5: Now, on the bottom side of the seam, take the needle down through the same stitch the thread last came out of on this side and pull the thread through, but don't lose the loop you made in the previous step. Step 6: The thread pulled through so you can see more clearly the path the thread takes. Step 7: Now, still on the same side, come up through the next stitch. 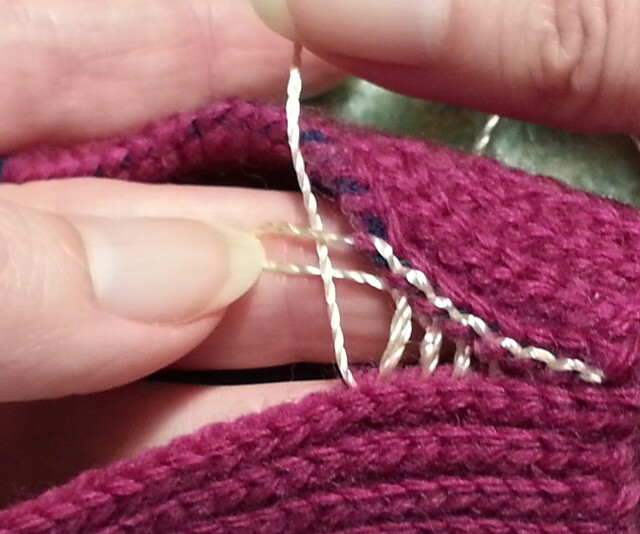 Pull the thread through, again being careful not to lose the loop you made earlier. 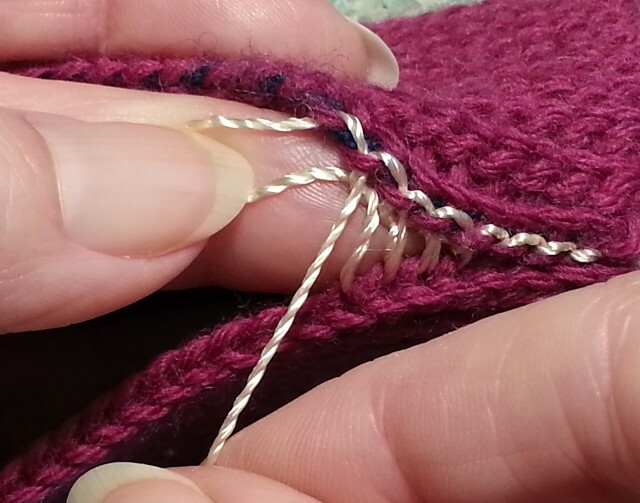 Tip: You would, in practice, combine this step with Step 5 to "scoop" a stitch up and you'd just pull the thread through once instead of doing that as a separate motion. I have split the steps here only so I can make it clear for you where the needle is going down through one stitch and up through the next. Step 8: This shows the thread pulled through so you can see how it went down through one stitch and up through the next - and how I've still got that loop in my thumb on the top side of the seam. 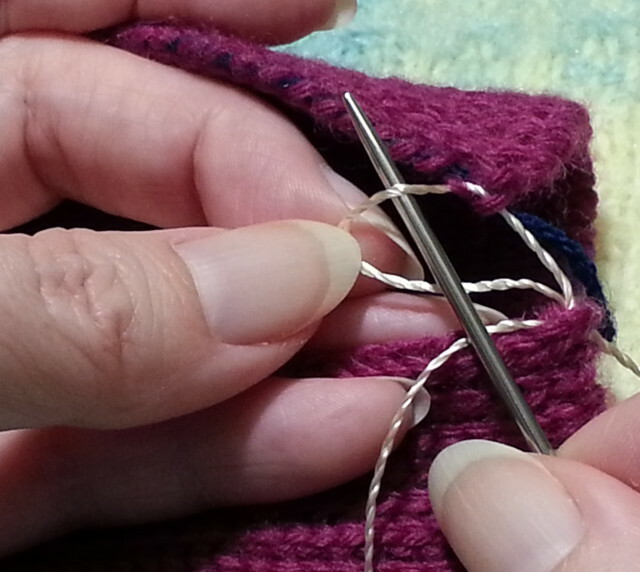 Step 9: Being careful not to let the loop in your thumb twist, take the needle up through the loop you held with your thumb and pull through. Step 10: You are now in this starting position but I have done a few more stitches to make it easier for me to show you the sequence again, as it looks with some stitches already made behind it. 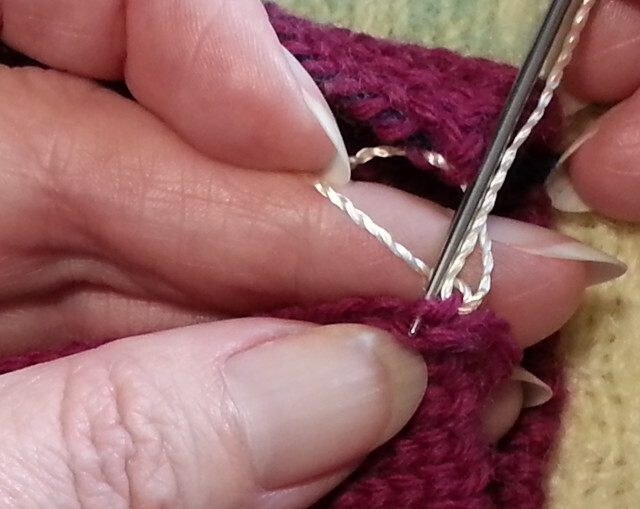 Steps 11 and 12: Up through the second back ridge stitch on the top side and pull through, being careful to hold a new loop in the left-thumb. Step 13: Down through the previous back ridge stitch on the top seam side AND down through the loop you had previously come up through (which is the one you made before with your thumb). 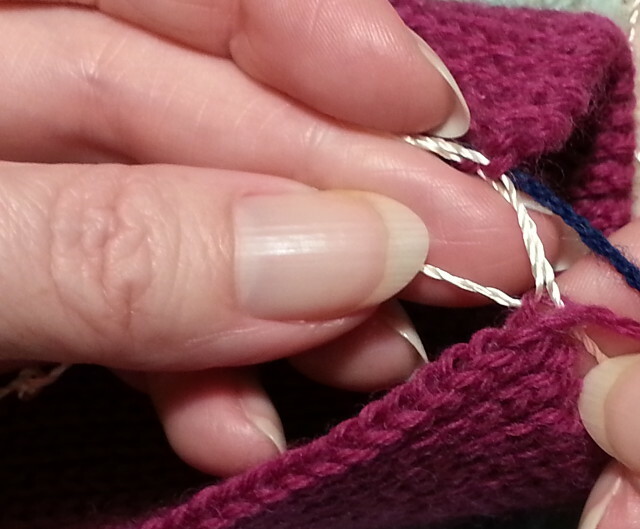 Step 14: Pull the thread through, being careful not to lose the new loop in your left thumb. Step 15: Now, on the bottom side of the seam, take the needle down through the same stitch the thread last came out of on this side and pull the thread through, but don't lose the loop you made in the previous step. Step 16: The thread pulled through so you can see more clearly the path the thread takes. Step 17: Now, still on the same side, come up through the next stitch. 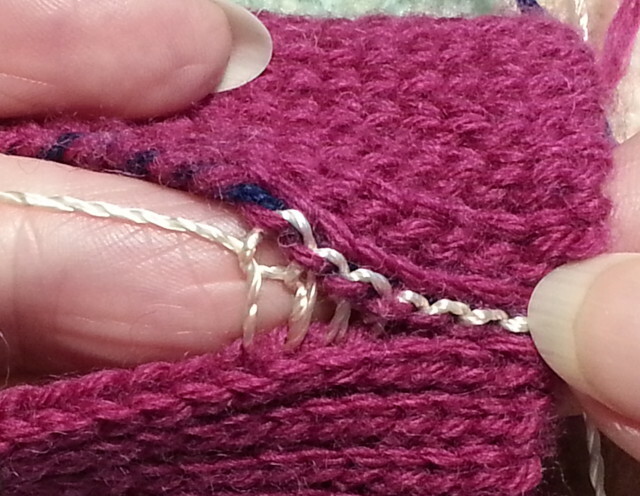 Pull the thread through, again being careful not to lose the loop you made earlier. 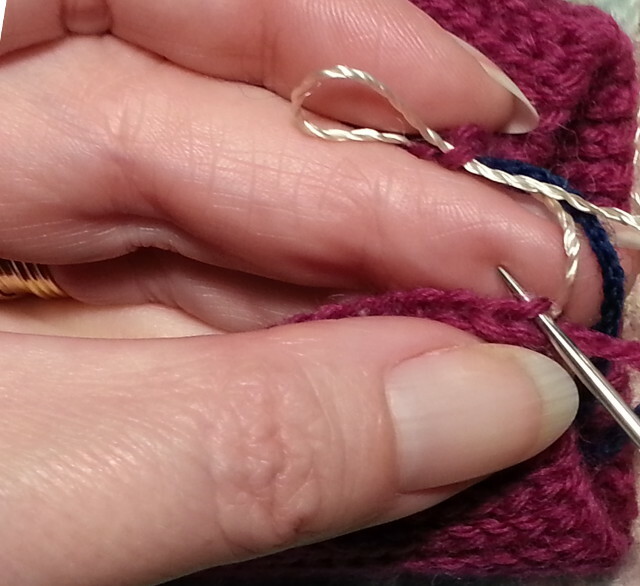 Tip: You would, in practice, combine this step with Step 16 to "scoop" a stitch up and you'd just pull the thread through once instead of doing that as a separate motion. I have split the steps here only so I can make it clear for you where the needle is going down through one stitch and up through the next. Step 18: This shows the thread pulled through so you can see how it went down through one stitch and up through the next - and how I've still got that loop in my thumb on the top side of the seam. 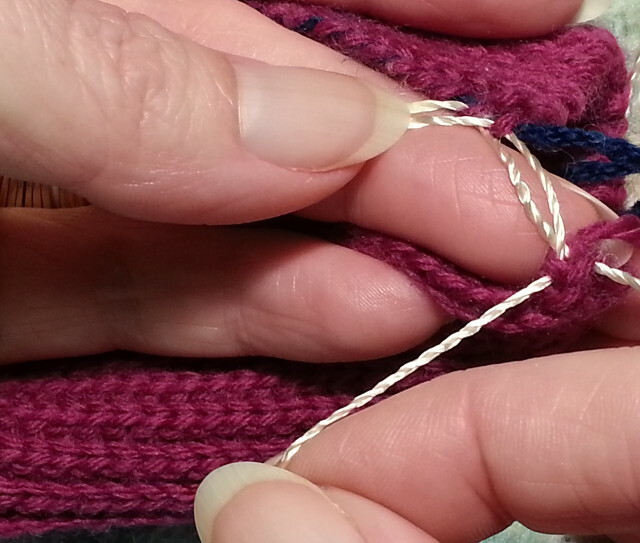 Step 19: Being careful not to let the loop in your thumb twist, take the needle up through the loop you held with your thumb and pull through. Step 20: With the thread pulled through you are back to the start position of the sequence again. 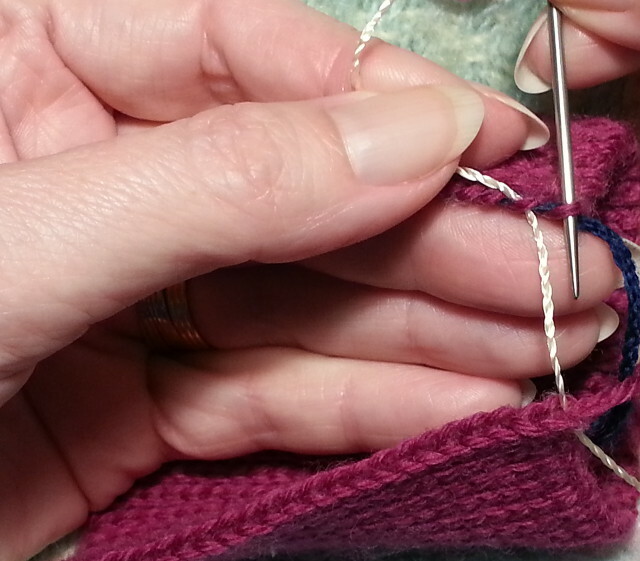 Step 21: Pulling the thread to the left after you have gone up through a loop allows you to tension each stitch. 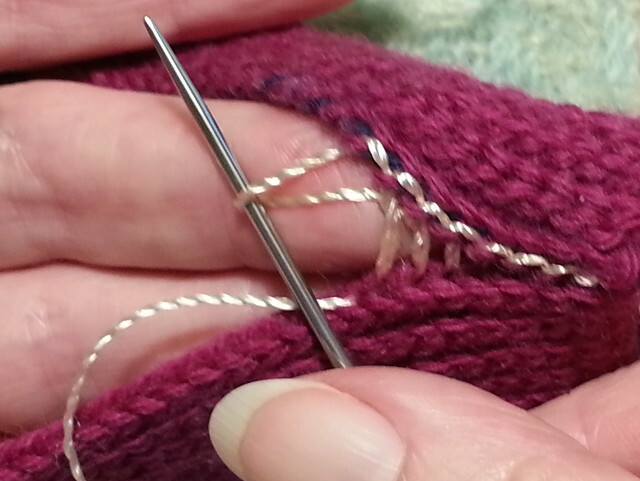 Step 22: Keep pulling the thread to the left to help tension the stitches. Don't pull it so tight, however, that you cannot easily get the needle back down through the same loop in a later step.